SOCIAL Reseller Business In A Box, Great Potential, Fully Automated! This social reseller website script is an opportunity to own a great online business for lifetime and get passive income for newbies and beginners or anyone without work or experience. 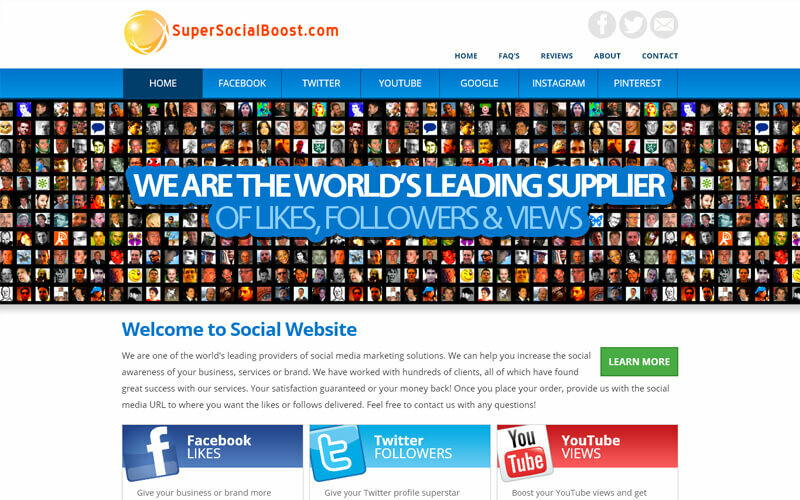 Social media business-in-a-box: Business that sells Social services in one site – HOT!! Exclusive DESIGN – Professional, Authority! HANDS-FREE PROFITS! “NO EXPERIENCE NEEDED”. The site is a brilliantly designed service where the reseller website offers a highly profitable internet marketing service. There is a huge demand for these services as they are significant services for any webmaster and online business to promote their websites and increases their traffic, revenues and profits. The website is completely setup; ready for business and made for you to create money. It is close to fully automated, with no website maintenance required and it only takes minimal work on your part to process customer’s orders. Social media popularity is at, an all time high. Every online business understands the importance of establishing a strong presence within Facebook, Twitter, YouTube, Digg and Google. Not only are these social media channels get a business popularity to increase, but they are also useful for getting direct, targeted traffic and customers to those online business websites. By owning a website that offers services tailored to increase a person or a business presence within these social media, you’re taking advantage of this incredible trend. Kick Start Your Internet Enterprise With This No Maintenance Website! It is a lot of work creating a website, and to be honest with you, many people have no idea where to start. Creating a website can be a complex process that takes time and effort. Now you can profit from our work; and have this site up and running and ready to sell products within a couple of hours of purchase. So How Can You Make Money? Instant payment will be sent to your PayPal account. You forward that order to the suppliers that I supply you with along with their small fee. Your supplier emails you once the order has been completed. You email the customer to inform them that that their order has been completed. This site is perfect for beginners, newbies or anyone who want to own their own profitable, automated online business. This is a real fully functional business with a proven business model that will allow you to be in business from day one. You only need to generate targeted traffic to it. It’s a great opportunity for those who are just starting out online. The suppliers for these services are top notch suppliers. You can rest easy that they will perform a great job fulfilling your customers’ orders while still offer incredible low rates for their services so that you can put a nice markup on their services. How will the website making money for you? -The service reseller business is highly profitable. On each order, you will often make more than 100% profit. Fully-loaded and easy to manage website. Professionally created and designed website that your customers will trust. Customer Service is great! – When I asked a question I got a very quick response! Keep it up. I started my own Online Business Using Social Reseller Script it helped to gain more revenue for my Business.